After realising a tractor won’t work on the soft muddy grounds of their new farm, Tassie farmers Dave and Andrea Riordan turned to a Takeuchi TL8 tracked loader. 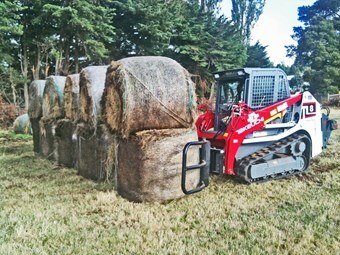 The Riordans have successfully handled over 700 bales with their Takeuchi TL8. When the Riordans bought their 170 acre farm in the Westbury area of northern Tasmania, they realised the soft ground conditions would be a challenge. Not only is there high rainfall where their farm is located, the property also has several springs which make parts of the property rather boggy. Wheeled tractors have already made a mess of some areas of the property, causing the Riordans to look for an alternative. With the benefit of project management experience, Dave Riordan undertook a requirements analysis to find a solution. "We needed equipment with the flexibility to load hay bales on to trucks, tow a trailer with tools and implements; run a slasher/mulcher; operate a PTO drive; pick up and move timber; load palletised firewood and supplied and carry out a myriad of other farming tasks – but without making an impact on the soft ground," Riordan says. After seeing a Takeuchi TL8 tracked loader with rippers fitted to the back, Riordan realised modification of some equipment attached to the ripper bar would make the machine ideal for their use. "A tow bar fitted to the ripper lets me tow the trailer loaded with implements to where needed and carried back to the shed at the end of the day," he says. "In addition, we wanted an air-conditioned cab and a reversing camera; the latter already paying for itself by preventing damages from reversing into other equipment." By using a combination of bale grabs and bale forks with the Takeuchi TL8, Riordan says he has been able to neatly and efficiently position two layers of bales on a truck. "So far we have moved over 700 bales with this machine and in weather and ground conditions that would be impossible for a wheeled machine," he says. Riordan adds the TL8 trumps wheeled tractors when it comes to spreading ground pressure. "For example, a tractor with a front end loader carrying a 500kg bale of hay will deliver around 690KPa (100psi) of ground pressure on the two front tires," he says. "The TL8 tracked loader has a ground pressure of just 30KPa (4.4psi) – a dramatic difference. "This means we can operate in the wet. For example, we had an inch and a half of rain and I was able to carry wet heavy bales with the TL8 on ‘spongy’ ground with ease. "With any other equipment I just wouldn’t have been able to work that day. We gained a whole day’s productivity and importantly didn’t damage the ground." Riordan says he also enjoyed the comfort of the air-conditioned cabin while working. 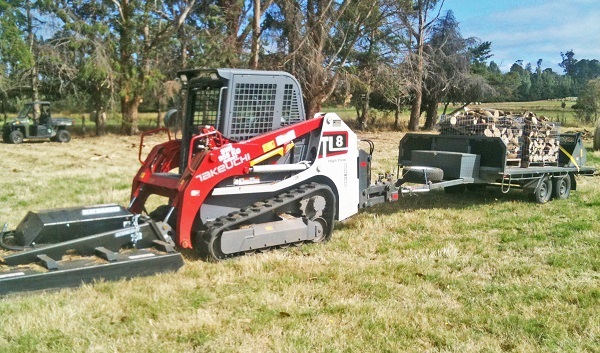 The Riordans' modified Takeuchi TL8 tracked loader with a slasher attached to the front and trailer at the back carrying palletised firewood. Riordan discovered a kit to fit to the back of the TL8 which turned the back of the machine into a three point linkage with a PTO drive. "Even though the loader has been worked for just a few weeks, it has already logged well over 100 hours," he says. He adds the TL8 has excellent manoeuvrability to get into tight corners and gives him superior lifting power over a tractor with a front end loader. The Riordans also use the TL8 to handle the palletising and transportation of firewood, as well as slashing and mulching tasks around the farm with the help of a large slasher/brush cutter. "The slasher has much more capability mounted on the front of the TL8 compared to the rear of a tractor," Riordan says. "I can operate the device vertically and trim windbreaks and other trees up to 5 metres off the ground. This has greatly reduced the labour involved in this task and increased the safety." For a 100hp machine from a well-known brand with an air-conditioned cab and front end loader (without attachments), Riordan says he would have to fork out about $115,000. "My TL8 machine is less than this, including all the attachments and optioned to your specification," he says. "Dollar-wise, it was a no brainer." Ease of operation was another reason the Riordans chose to purchase the Takeuchi TL8. "I wanted a machine that would be easy enough to encourage my wife to operate, as another driver increases our productivity," he says. "It makes sense if my wife is driving the loader and I can handle tasks that require greater physical strength." He adds changing attachments is a breeze with the TL8, thanks to its pressure release valves for changing hydraulic hoses and the push-button quick attachment control. Riordan says he was initially cautious about his non-traditional approach to farm machinery but concludes he wouldn’t have it any other way. "I have absolutely no regrets about spending the time to fully evaluate our needs," he says. "The performance of the Takeuchi tracked loader has far exceeded my expectations." Find Takeuchi loaders for sale. Look up Takeuchi tracked loader specifications.